Exploratory sections and archaeological investigations at the southeastern part of the construction site, January-July 2012 (Yiorgis Yerolymbos, Stavros Niarchos Foundation). As the Stavros Niarchos Foundation Cultural Center construction is progressing rapidly, unexpected archaeological finds come to light. 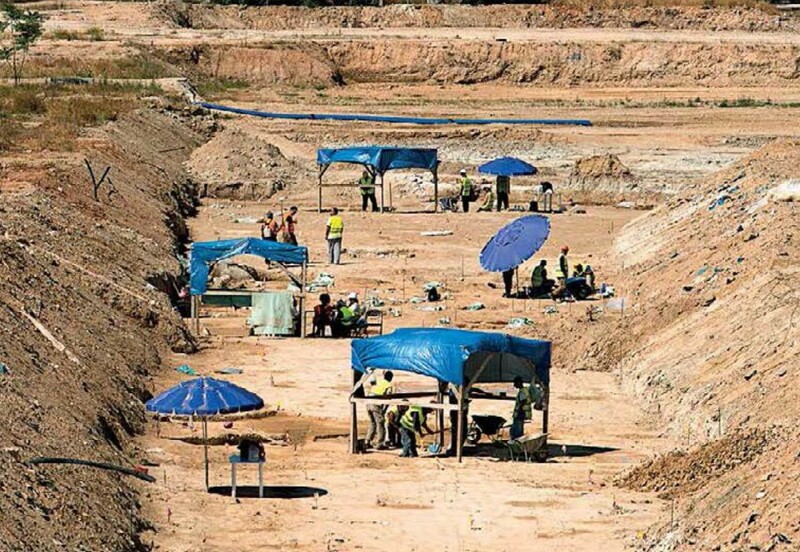 The past of the area is slowly being revealed during the rescue excavations conducted by the 26th Ephorate of Prehistoric and Classical Antiquities at the plot where the Cultural Centre is being erected. It seems that all evidence is directly connected to the burials of the people who inhabited the area from the 7th to the 4th century BC. The Archaic cemetery of Faliron has been known since the beginning of the 20th century. It covers almost 3,000 square meters and contains three types of burial: simple pit graves, pithos burials and cremations. The examination of child skeletal remains has shown signs of nutritional deficiencies which probably led to chronic vitamin deficiency and malnutrition. In addition, scientists found distortion of bones, probably due to lack of vitamin C, and disorders of the blood system. The analysis of the adult skeletal remains display signs of heavy labor, nutritional deficiency and metabolism disorders. Researchers have also found injuries, such as fractures of arms and legs. A group of Archaic simple pit burials without grave goods is particularly interesting as it “tells” stories of horrible punishment methods of prisoners during antiquity. The dead were buried with their hands tied behind their backs, and in some cases their hands and legs were tied together. Many of these dead show signs of injuries either before or after death. In one case, traces of metal chains were found on the fingers of the dead. This evidence leads to the conclusion that the adults buried in those pits were prisoners. It seems that these people suffered a violent death or were even tortured to death, said Director of the Ephorate Stella Chrysoulaki. “We know from written historical sources that the execution of prisoners was a common method until the Byzantine era. In ‘Pericles’ Plutarch refers to the apotympanismos (beating to death with sticks, cudgels, or clubs) of the defeated admirals after the Samian Revolt in 440 BC at the Agora of Miletus. However there is no historical evidence for violent executions” Mrs. Crhysoulaki added. Some of the most interesting finds of the rescue excavations will go on permanent display in the Stavros Niarchos Foundation Cultural Center. In addition, the Foundation will fund an interdisciplinary analysis of the skeletal material supervised by the Ephorate, so that more information about the everyday life of the inhabitants of the area and the methods of prisoners’ execution will be revealed.